Peptide (C)ETMRHG(S)LRLNQPTH, corresponding to amino acid residues 342-356 of rat TrkA (Accession P35739). Extracellular, 2nd immunoglobulin-like domain. Label ATTO-633. Maximum absorption 629 nm; maximum fluorescence 657 nm. The fluorescence is excited most efficiently in the 610 - 645 nm range. This label is analogous to the dyes Alexa 647, Alexa 633 and Cy5 and can be used for direct flow cytometry (FACS) using the He:Ne laser. Standard quality control of each lot Western blot analysis (unlabeled antibody, #ANT-018), and immunohistochemistry (labeled antibody). Immunohistochemical staining of rat dorsal root ganglia (DRG) frozen sections using Anti-TrkA (extracellular)-ATTO-633 Antibody (#ANT-018-FR), (1:50). 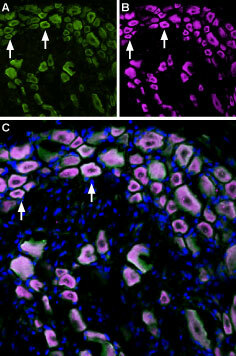 TrkA (purple staining) is expressed in DRG neurons. Hoechst 33342 (blue) is used as the counterstain. Immunohistochemical staining of perfusion-fixed frozen rat dorsal root ganglia (DRG) sections using Anti-p75 NGF Receptor (extracellular)-ATTO-488 Antibody (#ANT-007-AG), (1:60) and Anti-TrkA (extracellular)-ATTO-633 Antibody (#ANT-018-FR), (1:60). A. Sections were labeled with Anti-p75 NGR Receptor (extracellular)-ATTO-488 Antibody (green). B. 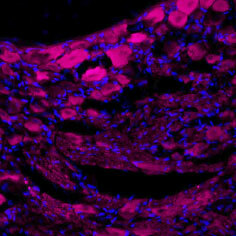 The same section was stained with Anti-TrkA (extracellular)-ATTO-633 Antibody (purple). C. Merge of the two images suggests extensive co-localization (arrow points at an example) of TrkA and p75NTR receptors in rat dorsal root ganglion. Cell nuclei were stained with DAPI (blue). Crowley, C. et al. (1994) Cell 76, 1001. Smeyne, R.J. et al. (1994) Nature 368, 246. Fagan, A.M. et al. (1997) J. Neurosci. 17, 7644. NGF was the first neurotrophin to be discovered more than 50 years ago. Three other proteins have been added to the list: BDNF, NT-3 and NT-4 (NT-4/5). These neurotrophins bind two groups of receptors. The p75NTR receptor is common to all four neurotrophins and is a member of the tumor necrosis factor receptor family. The tropomyosin-related kinase (TrK) receptors are receptor tyrosine kinases (RTKs) and three receptors form this family: TrkA, TrkB, and TrkC1. As mentioned, the p75NTR receptor binds to all neurotrophins with similar affinities while the Trk receptors display selectivity for the neurotrophins. TrkA is activated by NGF binding, TrkB by that of BDNF and NT-4, while TrkC is stimulated by the binding of NT-31. All three Trk receptors are highly expressed in the mammalian brain in very distinct regions and are also expressed in the peripheral nervous system2-4. Cholinergic neurons in the basal forebrain exclusively express TrkA. All three Trk receptors are expressed in the hippocampus. Motor and sensory neurons in the peripheral nervous system express Trk receptors. Interestingly, while Trk receptors are not essential for development, knockout mice die shortly after birth. Indeed, TrkA-deficient mice demonstrate a significant decrease in cholinergic and sympathetic neurons in the trigeminal, superior cervical and dorsal root ganglia5-7. Trk receptors are type I membrane proteins (i.e. span the membrane with one transmembrane region) and have many motifs in the extracellular region, including cell-adhesion domains, three tandem leucine rich motifs flanked by two clusters of cysteines. In the membrane proximal region of the receptor there are also two immunoglobulin-like domains8. The intracellular region of the protein contains the kinase domain, responsible for activating downstream effectors as well as many adaptor site regions important for the binding/interaction of signaling molecules. The binding of neurotrophins to Trk receptors promotes receptor dimerization resulting in kinase activation. Activated Trk receptors then phosphorylate a cascade of signaling molecules including the Ras/ERK, PI3K/Akt pathways and PLC-γ1. Activated Trk receptors also create internal docking sites for other signaling adaptor proteins to bind8. Splice variants of TrkA, TrkB and TrkC have been observed. These splice isoforms are mainly effected in the tyrosine kinase domain of the receptor lying in the cytoplasm. Endocytosis is an important signaling trait of Trk receptors. Following neurotrophin binding to the Trk receptor, the receptor complex is then internalized via endocytosis in order to terminate signaling. However, in the axonal compartment of neurons, the internalization process of the neurotrophin complexed to the receptor is part of the signaling process and is important for activating transcription processes in the nucleus9,10. Immuno-colocalization of TRPM8 and TrkA in rat DRGImmunohistochemical staining of perfusion-fixed frozen rat dorsal root ganglia (DRG) sections using Anti-TrkA (extracellular)-ATTO-633 Antibody (#ANT-018-FR), (1:60) and Anti-TRPM8 (extracellular) Antibody (#ACC-049), (1:300). A. TRPM8 labeling followed by goat-anti-rabbit-Alexa-488 (green). B. The same section was then labeled for TrkA (purple). C. Merge of A and B demonstrates co-localization of TRPM8 and TrkA in rat DRG (arrows). Cell nuclei were stained with DAPI (blue). Anti-TrkA (extracellular) Antibody (#ANT-018) is a highly specific antibody directed against an extracellular epitope of the rat protein. The antibody can be used in western blot, immunohistochemistry, live cell imaging, and indirect flow cytometry applications. It has been designed to recognize TrkA from mouse, rat, and human samples. Anti-TrkA (extracellular)-ATTO-633 Antibody (#ANT-018-FR) is directly labeled with an ATTO-633 fluorescent dye. ATTO dyes are characterized by strong absorption (high extinction coefficient), high fluorescence quantum yield, and high photo-stability. ATTO 633 has a maximum absorption at 629 nm and a maximum fluorescence at 657 nm. The fluorescence is excited most efficiently in the range 610 to 645 nm. This label is analogous to the well-known dyes Alexa 647, Alexa 633 and Cy5. Anti-TrkA (extracellular)-ATTO-633 Antibody is especially suited for experiments requiring simultaneous labeling of different markers. Anti-TrkA (extracellular) Antibody (#ANT-018), (for western blot analysis). Anti-TrkA (extracellular) Antibody (#ANT-018). This antibody recognizes an extracellular epitope and be used to detect TrkA in live cells.